Darwin is the capital city of the Northern Territory of Australia. It is the largest city in the sparsely populated North Territory, but the smallest of the Australian capital cities. It is the northern most city in the territory, which is situated on the Timor Sea. Because of Darwin 's proximity to South East Asia, it serves as a gateway to the continent of Asia. Darwin is recognized for its multiculturalism as over 50 different nations and cultures make up the population. Kakadu National Park is a protected area in the Northern Territory of Australia, about 100 miles east of Darwin. It is the largest national park in Australia covering 7,646 square miles, and measuring nearly 125 miles from north to south and 62 miles from east to west. The park is roughly half the size of Switzerland. Kakadu features many diverse landscapes perfect for outback adventure travel, nature activities and experiencing aboriginal culture. The little penguin is the smallest species of penguin. They are found on the coastlines of southern Australia and New Zealand. In Australia they are often called fairy penguins and in New Zealand they are known as little blue penguins or blue penguins. Tasmania is an island state a part of the Commonwealth of Australia located 150 miles south of the Australian mainland separated by the Bass Strait. The state includes in the island of Tasmania and the surrounding 334 islands. Tasmania is promoted as a natural state with 45% of Tasmania being reserves, national parks and World Heritage Sites. In 1856 it became a self-governing colony and was renamed Tasmania, and in 1901 became part of Australia. Sydney Harbour by night....it doesn't get any better than this. Enjoy million dollar views and expansive viewing decks...it's an experience not to be missed! Marvel at the scenic vistas the harbour has to offer including Sydney 's magnificent skyline and iconic attractions, the Sydney Opera House and the Harbour Bridge. Mount Cook is the highest mountain in New Zealand at 12,218 feet in height. It lies in the Southern Alps, which is a mountain range that runs the length of the South Island. The mountain is a part of Aoraki/Mt. Cook National Park. Mt. Cook is a popular challenge for mountain climbers and is a popular destination for tourists. Wellington is located on the southwestern tip of the North Island. It is the world's southernmost capital city as well as being the most populous and remote as it is the furthest away from any other capital. Being built on the foreshore of a harbor and ringed by mountains, this gives the city the nickname Windy Wellington. Rotorua is a city on the southern shores of the lake of the same name, on New Zealand 's North Island, and is in the heart of the North Island located 140 miles southeast of Auckland. The area is known for its geothermic activity and features geysers and hot mud pools as the town lies on the Rotorua caldera which is where the thermal activity is from. The tourism industry is by far the largest industry in Rotorua and is popular with both domestic and international tourists. Auckland is a city in the North Island of New Zealand and is the largest and most populous area in the country. Roughly one third of New Zealand 's population resides here. Dating back to the year 1350 when the Maori people founded the land, known for being rich and fertile. It is now known for its parks, nature, and volcanic fields as well as rich culture, many festivals and a good quality of living. Choose to visit the Sir Edmund Hillary Alpine Center and learn how the story of the Mt. Cook region intersected with the exploits of one of the 20th century 's greatest explorers. Or, go stargazing with a naturalist under pristine Southern skies late evening. 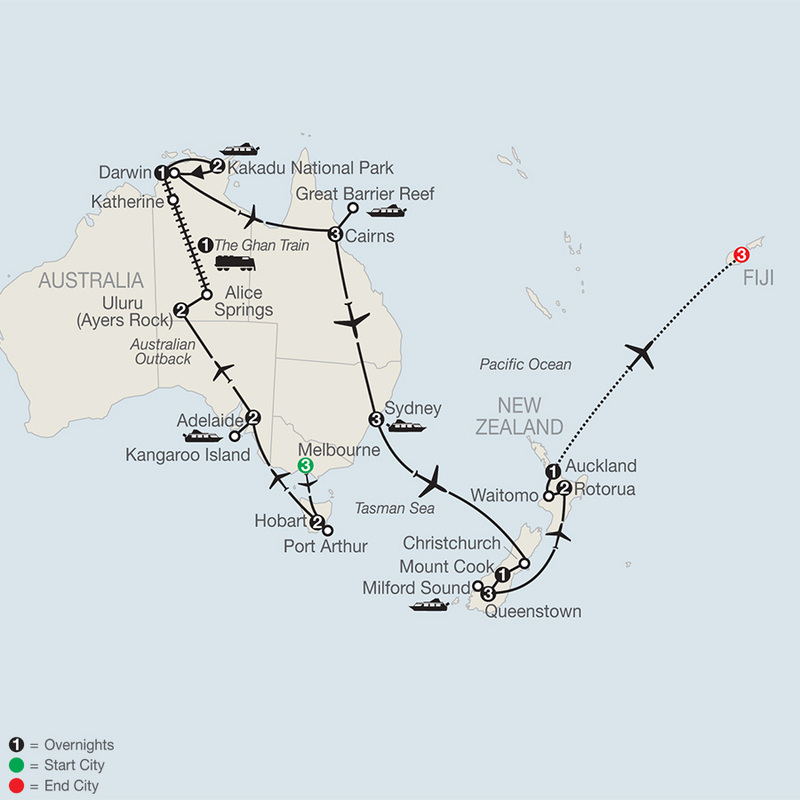 Meet a koala, enjoy a bush dinner in the Outback, cruise the pristine waters of Milford Sound - do it all on The Complete South Pacific, an unforgettable 25-day journey through Australia and New Zealand. Toast Uluru (Ayers Rock) at sunset with champagne. Spend two nights on the Australian island state of Tasmania and visit the Tasmanian Devil Conservation Center. Visit the Phillip Island nature preserve to learn about the world 's largest colony of Little Penguins. Board the Skyrail Rainforest Cableway for an unforgettable ride over the rainforest canopy. Explore the waters of Kakadu National Park, home of the fearsome saltwater crocodile. Take in the sights during a delightful dinner cruise of Sydney Harbour and choose how to best explore this amazing city. Discover the colorful world of the Great Barrier Reef. Marvel at New Zealand 's majestic fjord, Milford Sound. Spend two nights in Rotorua, a geothermal wonderland. 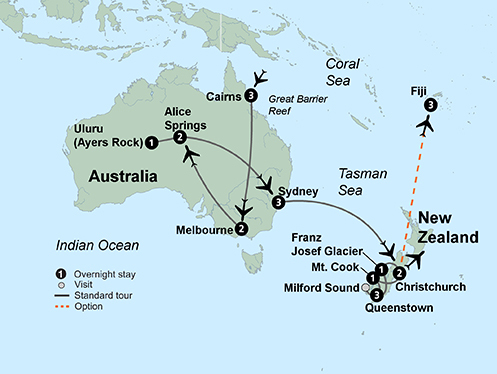 Enjoy a home stay and dinner with a New Zealand family. 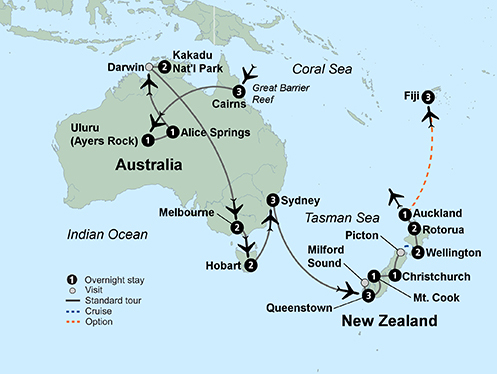 Throughout your adventure explore Aboriginal and Maori traditions. Your tour opens in Cairns, the tropical gateway to one of the world 's most spectacular natural attractions - the Great Barrier Reef (UNESCO). Established as a marine park in 1975, the reef is a haven for thousands of species of sea life, as well as turtles and birds. Rise high on the Skyrail Rainforest Cableway for an unforgettable ride over the rainforest canopy. Embrace the opportunity to explore the forest floor up close with access to specially designed boardwalks. Your evening is at leisure to enjoy your tropical surroundings. Fly to Uluru (the Aboriginal name for Ayers Rock) in the heart of the Australian Outback. Tour the sandstone domes known as Kata Tjuta and the beautiful area surrounding the base of “The Rock.” Later, witness a stunning sunset over a glass of champagne as the Rock 's hues change dramatically with the setting sun. Hop over the “Red Centre” on a short flight to Alice Springs. Tour the area and learn how people once communicated in the remote Outback at the Old Telegraph Station, dating back to the 1800s. Visit the School of the Air to find out more about the educational system of the Outback. There 's even a chance of witnessing a class in session! Become locally invested as you have the opportunity to meet the young Aboriginal group, Drum Atweme. Supported by the Collette Foundation,* Drum Atweme is a musical group comprised of at-risk youth from the local community. Tonight, continue your cultural immersion with a memorable bush dinner set against the backdrop of this unique desert environment. Access the history and culture of the Aboriginal people during a "Dreamtime Tour.” A specialist guide shares Aboriginal creation stories and explains everyday life. You 'll even taste native cuisine. Later, board your flight to the city of Darwin on the northern edge of Australia and drive into the heart of Kakadu National Park. Soak in the natural beauty of the “Top End.” Kakadu National Park is home to crocodiles, wallaroos and wallabies, monitors and lizards, and birds of every imaginable variety. Witness artwork dating back thousands of years as you view Nourlangie Rock. During an afternoon cruise, be on the lookout for crocodiles as they bask in the sun, as well as waterfowl such as jabiru, egrets, herons and eagles. A flight to Hobart, Tasmania brings you to Australia's second oldest city. The rugged and pristine beauty of Tasmania provides the backdrop to your 2-night stay. Brace yourself for the Tasmanian Devil! Visit the Tasmanian Devil Conservation Center and learn about this unique marsupial, its fight for survival, and the efforts in place to save it from extinction. Later, take a guided tour of the Port Arthur Historic Site, the best-preserved example of Australia 's original penal colonies and home to stabilized ruins and restored buildings dating back to 1833. En route, witness the spectacular coastal rock formations known as Tasman Arch, Devil 's Kitchen and the Blow Hole. Enjoy a day at leisure. This evening, say your farewell to Australia while taking in the sights during a delightful dinner cruise of Sydney Harbour. Marvel at the scenic vistas of the harbour showcasing Sydney 's magnificent skyline, the iconic Sydney Opera House and the Harbour Bridge. En route to Milford Sound, enjoy the rugged grandeur of the Hollyford Valley. You 'll travel through beech forest via the Homer Tunnel. During a cruise of the breathtakingly beautiful Milford Sound you 'll see why this fjord is one of the most visited sights on the South Island. With rock faces that rise nearly 4,000 feet on either side, the scenery will take your breath away. Following your cruise, you return to Queenstown. You may choose to return via a short optional flight (weather permitting) for spectacular views of New Zealand 's Southern Alps. A free day in Queenstown offers limitless diversions set amidst breathtaking Alpine scenery. Shop in the charming village center or enjoy an optional and exhilarating jet boat ride on the Shotover River. Or, perhaps you will join the optional "Journey through Middle Earth" tour which takes you through the majestic Remarkable Mountains and the breathtaking Queenstown countryside showcasing many of the spots where The Lord of the Rings movies were filmed. Travel to the historic city of Christchurch, the “Garden City”. Enjoy some free time to explore. Perhaps you 'll stroll the city 's magnificent gardens or learn about its more recent history at the Quake City exhibition at the Re:Start Mall. Come to know Wellington on a tour viewing the Beehive, New Zealand 's Parliament; historic St. Paul 's Church; and the Old Government Building - the largest wooden building in the Southern Hemisphere. Explore the National Museum of New Zealand, Te Papa Tongawera, a fascinating center dedicated to art, history and the Maori culture. Drive to Rotorua with its dramatic geothermal landscape. Over one-third of its population boasts Maori roots making it known as the Maori capital of New Zealand. You 'll feel right at home this evening when a New Zealand family welcomes you into their home for the night! ** This is sure to be an unforgettable experience as you make new friends, learn about the customs of the “Kiwis,” and enjoy a home-cooked meal. Discover Te Puia - New Zealand's premier Maori cultural and geothermal experience. Witness how the Maori keep their culture alive by teaching the tribal youth traditional carving and weaving. Enjoy the chance to see the Kiwi bird and learn about the preservation efforts being made to remove this marvelous creature from the endangered species list. Next, meet the skilled carvers who work with pounamu, New Zealand greenstone, at a jade factory. At the Agrodome, see a sheep shearing demonstration and learn about the importance of agriculture to the nation. Travel through the majestic countryside of the North Island, arriving in New Zealand's largest city, Auckland, "The City of Sails." A panoramic city tour features the America 's Cup Village, the War Memorial, vibrant Queen Street, the Auckland Harbour Bridge, and spectacular views from the harbourside. Tonight, join your fellow travelers at a local restaurant for a farewell dinner where you will toast the end of a wonderful trip! Your tour comes to a close in Auckland. Set out on a city tour and see Fitzroy Gardens and the bustling “laneways” of Melbourne. There is time at leisure to explore the city independently. Later, see koalas in their natural setting during a stop at a koala conservation center before arriving at Phillip Island, a renowned nature reserve and home of the world 's largest colony of Little Penguins. Protected and studied by rangers, hundreds of them waddle out of the sea and cross the beach to their burrows in the dunes. At the interpretation center, you have a chance to learn about the lives of the Little Penguins and their significance to the region. Return to mainland Australia today and arrive in the bustling city of Sydney. Enjoy a panoramic tour of Sydney, birthplace of modern-day Australia. Highlights include Kings Cross, the Harbour Bridge, Chinatown, the Rocks, Circular Quay, the Botanic Gardens, and the fashionable suburb of Paddington. Marvel at one of the world 's most fascinating architectural wonders during a guided tour of the Sydney Opera House. Next, you 're in for a unique experience as you learn firsthand about opals during a special presentation at the National Opal Collection. This evening it 's Diner 's Choice as you choose from a variety of local restaurants along bustling Darling Harbour. Enjoy a morning at leisure to discover the wonders of Sydney. Stroll through the city streets, visit the historic Rocks area or simply relax. This afternoon the choice is yours! Experience the area at your own pace with a 24 hour hop-on hop-off Sydney Harbour cruise pass...hop off to explore places of interest or stay on and relax during a narrated cruise. Or, you may choose to visit two of Sydney 's unique attractions…ascend the Sydney Tower Eye for incredible views before exploring the renowned Sea Life Sydney Aquarium. 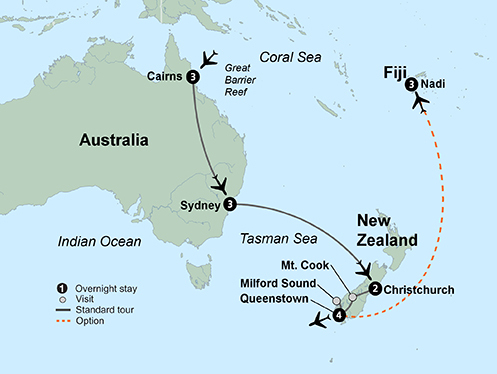 Fly to one of the world 's best-kept secrets - New Zealand! Arrive in gorgeous Queenstown. Dinner is at the famous Skyline restaurant overlooking Queenstown, Lake Wakatipu and the Remarkable Mountains. Set out for the beautiful turn-of-the-century gold rush settlement of Arrowtown. 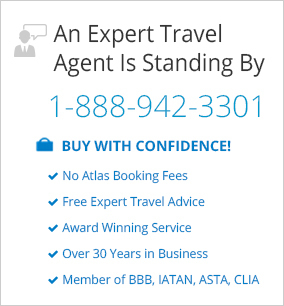 Take time to explore independently and stroll its quaint, historic streets. Next, follow the Kawarau River and cross the Lindis Pass as you set foot in New Zealand 's most famous national park, Mt. Cook. Enjoy an optional glacier flightseeing tour (weather permitting) before arriving to your hotel at the base of the mountain. Upon arrival the choice is yours: visit the Sir Edmund Hillary Alpine Center and learn how the story of the Mt. Cook region intersected with the exploits of one of the twentieth century 's greatest explorers or, very late that evening, participate in stargazing with a naturalist under the pristine Southern skies.